Open cartons in seconds without damage to box contents. 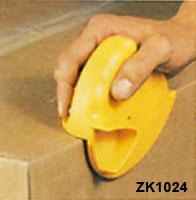 The opener shields the blade whether in use or not, and the blade position is adjustable for height and depth. Two models are available. The premium model, built to last a lifetime, is made from rustproof unbreakable zinc. The economic model is made from high impact plastic.